When we think about twenty-first century business leadership, remember that we learned how to interact within an organization back in elementary school where there was an established hierarchy consisting of principal, teachers and students. As we get older and take on business roles, we often fall back on behaviors we learned as children. Leadership is one area where these prototypes are prominent and come to the fore. One of the reasons we can cope with our management team is that we knew people just like them back in the schoolyard. 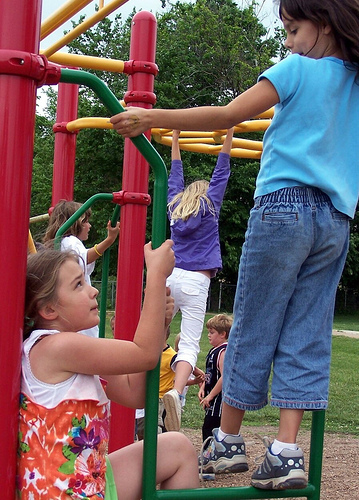 To understand today’s business leaders, here are thirteen prototypes of children that appeared on playgrounds across the United States. Although they may have had different names, we all recognize them and remember them as if we just got home for milk and cookies. The Brain. This child always had his head down and his nose in a book, specifically not the one that the teacher was discussing in class! Yet, somehow he always managed to have the right answer when the teacher called on him to catch him off guard. Often, this student was also a nerd. The Leader of the Pack. The kid that everyone wanted to be. Usually very good looking and had cool parents. To add to his allure, he always did well in class and excelled at extra curricular activities. The Class Jock. He was the best athlete regardless of the sport. (While girls could be good at sports, excelling wasn’t a badge of honor.) In class, he often sat there and just looked good. The Schemer. This student was generally a guy. He always had a plan to get around anything. While life might be easier if he followed the rules, that wasn’t his style. Most of the time, he was able to convince others to follow him. The Gossip. Generally was one of the girls who always had something to say about everyone. It was as she had special antenna for gathering information about others, often of a negative nature. The Teacher’s Pet. This student always sat in the front row and did whatever the teacher asked. Her voice dripped like syrup whenever asked to do something by the teacher. She was ready to tell the teacher or other adult anything at the drop of a pin. The Follower. These children were the majority of the class who just wanted to be part of the gang. None of them stood out and most never had an original idea. They were nice but unexceptional. They were always ready at the beck and call of the leader of the pack. The Pampered Princess. Another generation would call her spoiled. This girl’s parents give new meaning to the name helicopter parents. Regardless of what she did, her parents were the first ones in the principals office arguing that she did no wrong. The Bully. The person everyone else in the class was afraid of and would do anything he asked without question. There were male and female versions of the bully. The ‘Fraidy Cat. This kid was scared of his shadow. He was often smaller than the other children with a propensity to get sick. Most notable was his unwillingness to take any chances. The Class Dunce. While he was a nice kid, he was totally clueless about whatever was going on in class. He never had the right answer when the teacher called on him. The Problem Child. He was a magnet for trouble of every sort. Misbehavior was his middle name. Further his parents were out of sight and out of mind. The Looser. The one person no wanted to be seen with. Even worse, no one wanted to be that person. He was the last person chosen for anything. Even the teacher had a hard time dealing with him. In our simplified view of the world when we were younger, we tended to focus on one attribute or characteristic of each of our schoolmates. As we matured, we became more well-rounded individuals and found that the people we know have a broader, more developed array of traits, some of which may be inconsistent. Therefore, in terms of leadership, the important challenge is to position ourselves with respect to others in order to accomplish our goals. While we may have been assigned one of these roles to play as a child, it doesn’t mean that we still have to be that person as an adult. Therefore it’s incumbent upon us to examine the roles that we’ve been assigned and determine where we want to go. Then take the scary step towards changing how we see the world and how others see us in order to manage others. Leadership requires that we take control of our own destiny before we light the way for others. Do you see any of these playground types on your management team? If so, how do you deal with them based on what you learned in school? Note: This blog post was part of the #UsBlogs. An exercise by the members of UsGuys on a set topic of the week. This week’s topic was Leadership. Further, Lisa Petrilli who runs the LeadershipChat gets a hat tip as well. Tags #UsBlogs, #UsGuys, Leader, leadership, Leadershipchat. Bookmark the permalink. ← How to Make Your Blog Popular? I’m with them; you made me smile reading this post. Love this quote, ‘Leadership requires that we take control of our own destiny before we light the way for others.’ So few folks seek self discipline and direction before seeking to tell others what to do. I learned this earlier in life and yet I still struggle. In school I was the brain at times, leader at others, and tried so hard to just be a follower for a while. Sometimes you can’t be the one you wanted while in high school. Today it’s somewhat easier but at times you just have to be who are you are and let that lead others along. Oh, Heidi, I had such a broad grin as I was reading! Yes, of course I knew each and every one of these kids! I guess we all did. I was a mixture of a few, because I was shy, yet wanted to be kind. (Mom ordered it!) How simple life seemed, I think now. But looking back, you know, it wasn’t all that easy…some of those roles were tough to put up with, survive, or be! I think you’ve broadened my understanding of leadership: every prototype can be a leader–for better or for worse. Perhaps I need remember to my own childhood role, challenge (as you mention), and consider ways to cultivate that leadership. And yes, what goes on in the playground in lower school, also happens in staff meetings in the upperschool!